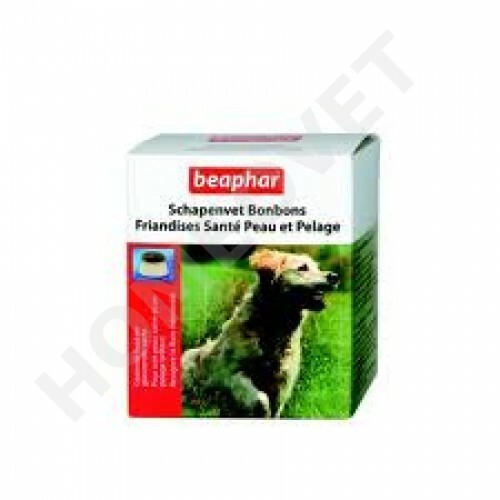 Beaphar Sheep fat treats with seaweed are a particularly good product for skin problems and are also rich in vitamins and minerals; a delicious daily supplement. The precious natural ingredients of the fat and the added vitamins E and F (linoleic acid) support a healthy skin and contribute to a beautiful shiny coat of the dog. The natural sheep fat sets off a protective layer in the intestine and supports the feed intake and digestion. Protein 1.0%, fat 93.0%, fiber 2.0%, ash 2.5%, moisture 0.7%.